McNary High School senior Suni Payne didn’t entirely know what she was getting into when she joined FBLA (Future Business Leaders of America) two and half years ago. “I’ve always wanted to be an entrepreneur and when picking our schedules, I wanted to get involved in the business programs here and honestly I didn’t know what this (FBLA) was when I started,” she said. But Payne, who wants to one day own her own bakery, quickly got involved and joined the officer team at McNary. Last spring she was then voted vice president of the Willamette Valley regional at the Oregon FBLA State Conference in Portland. Brad Lomax, a McNary business teacher and the club’s advisor, has seen Payne mature through her work with FBLA. “She’s a perfect example of a student getting involved in an after school program and being immersed in it and taking responsibility for it and growing as a person,” Lomax said. As a VP, Payne and McNary will host seven other high schools (McKay, North Salem, West Albany, Central, Silverton, Stayton and Kennedy) in the Willamette Valley FBLA Regional Skills Conference on Saturday, Feb. 11. More than 160 students will compete in events like accounting, banking and financial systems, entrepreneurship and public speaking through role playing case studies and online tests. When not competing, students will also have the opportunity to participate in workshops put on by businesses leaders in the community. The regional conference is practice for state, which this year takes place April 6-8 in Portland. How a student performs at regionals does not determine whether they go to state. “The main goal of this is to get instruction and help from the judges because this is in preparation for state so any feedback on how they can increase their performance, I think that’s the key to this entire event and the reason for doing it,” said McNary FBLA President Samuel Hernandea. 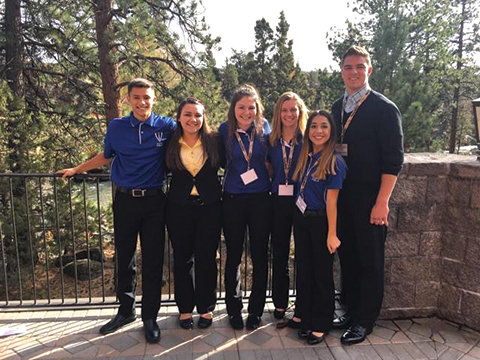 McNary has 64 students in FBLA, the largest percentage of any school in its region. The club meets each Wednesday after school. Kolby Barker, McNary’s vice president of public relations, is working on getting local business people to judge the events. The regional conference begins with the opening ceremony at 8:30 a.m., followed by competition until noon and then lunch and awards.